For many chronic back pain patients, a technique called discography has been used to determine the need for surgery. The procedure has been controversial, and a hotly debated topic by spine specialists. The procedure usually means a small needle is introduced into a disk, and chemicals (usually saline, contrast dye, and some lidocaine) are injected into the disk. When the chemicals are injected, the disk is pressurized. If the patient experiences a specific kind of pain, the discography study will be considered concordant. 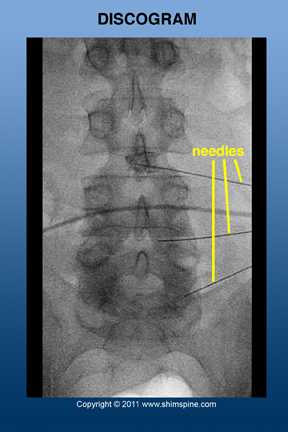 Most of the time, a asymptomatic “normal” disk is also injectioned. The theory is that a “normal” disk should not cause any pain. That is considered a control level. If you have this contrasting response, the study is considered significant. For surgeons who utilized the technique, it was a useful tool to determine the need for fusion or discectomy surgery. For surgeons who had concerns, it was not a reliable test, and often led to additional surgery without long term benefit. Within the debate about the relevance of the discography test, there was a concern about the potential long term effects of the procedure itself. Originally, it was thought not to have any complications other than the pain associated with the technique, and the small potential for infection. Now, more and more information show there may be long term effects that may cause damage to the disk that is injected. The reasons are multiple. The injection materials, contrast dye and lidocaine turn out to potentially cause damage to the cells of the disk. Puncturing the disk may start the disk degeneration process. Recently Dr. Eugene Carragee and colleagues reviewed the 10 year results of volunteers who underwent discography, compared to a matched group who had all the same characteristics, but did not undergo the procedure. While there was not 100% followup, the rates of spine surgery of the discography group was almost a 4 fold more than the group that did not have the procedure. Remember that this group of volunteers had no or minimal back pain symptoms. While one study does not automatically make the case that discography can be a problem, there are plenty of other studies that support caution, or termination of the use of the discography technique. If your surgeon recommends discography, please make sure you understand why he/she is recommending the procedure, and ask if there is an alternative.